IAMBRIGITTE : i'm a good cook...not! 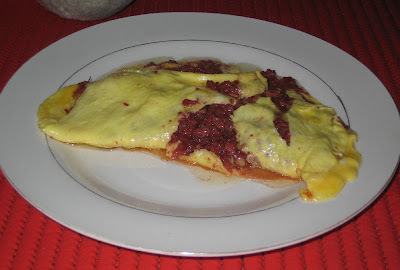 so for lunch, i tried to make a corned-beef omelette. just a simple one though...and i think i did a great job...in messing it up! i think it's because i had too much corned beef and i only used two eggs...or because of the pan? or maybe i was just in a hurry because i was dead-hungry. whatever it was, it's not my fault! I love omelettes as well and my favourite is cheese with mushrooms and tomatoes served with french fries... Yummm! I cook my omelette using butter insted of cooking oil... slowly... I cheat by sprinkling the cheese on top of tomatoes and mushrooms as it tend to hold the omelette together ha ha ha! I stick my french fries into the oven before I start preparing so they are ready at the same time. whoa, thanks for the tips girls...will try again soon and will let you know. 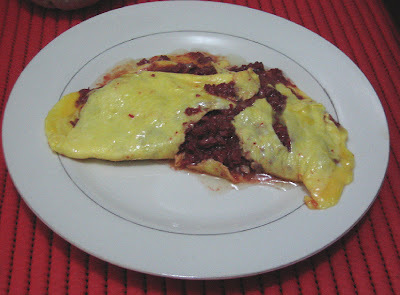 hehehe...i love omelettes too, but i am just too lazy to add other stuffs like tomatoes, etc. but i'd love to! me too! speaking of fry foods.. i'll be havng spam tom.. wish me luck!! :) hope i cut it just right. lol! You always make the most interesting and down to earth posts! Love it!